I made this kit a year ago. My wife loves it. We’re running out so I’m getting ready to order another kit. Labels weren’t included in last year’s kit but I see from the current description that they are. Can you confirm that? Hi Ron, we love hearing how much you and your wife have enjoyed this product! As for the labels, yes, all of our Orchard Beezin’ kits include labels in them. I hope you enjoy your next batch of Rocking Raspberry Rosé just as much. Cheers! Do your wine kits contain gluten in the ingredients? Hi Deb, no, our wine kits and components do not contain gluten. Hey, thinking about buying this at my local shop. The misses loves rose. Is it possible to make this sparkling? Do you have any recommendations? Hi Paul, this wine tastes great when it is carbonated. You can do so easily yourself by mixing the wine with soda water to make it a spritzer. 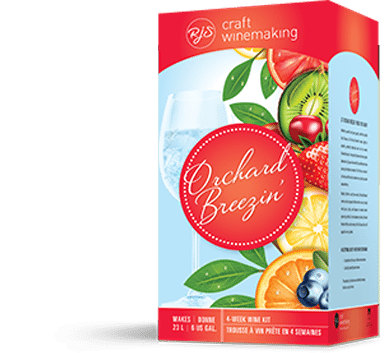 Some home carbonation systems that allow you to add a little spritz to your favourite beverage work great with our fruit wines. The alcohol content differs depending on which product you are making and how you are making it. Please email our customer support person Chris Holman at rjsinfo@cbrands.com for more specific information.